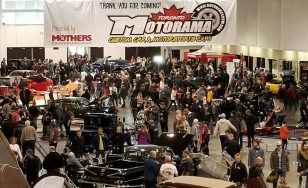 The 5th annual Motorama Custom Car & Motorsports Expo takes place March 8, 9 & 10 2019 at The International Centre, across from Toronto’s Pearson International Airport. Friday, March 8: 10 a.m. to 9 p.m.
Saturday, March 9: 10 a.m. to 8 p.m.
Sunday, March 10: 10 a.m. to 5 p.m.
11:00 to 12:30 p.m. – AUTOMOTIVE EDUCATION AND CAREER PANEL: Several members of the automotive education, auto industry and motorsports communities will take part in this discussion about their respective programs / companies / careers and how those interested in a future in one of these areas can get involved. Hosted by Rick Seeley, expected participants include: Bogi Lateiner (All Girls Garage), John Mifsud (Professor of Motive Power / Centennial College), Yvonne Potter (Paton Racing Top Fuel team), Ric Potvin (Canadore College), Grant Schwartz (Vegas Rat Rods & Schwartz Welding), Taylor Thring (stock car racer / #BurnOutTheBully), Wayne Toth (Niagara College) and TJ Zizzo (NHRA Top Fuel drag racer). 5:30 to 7:00 p.m. – SHORT TRACK PROMOTERS: A collection of Ontario’s top short track, dirt oval and series promoters will be on hand to participate in a Q&A session with fans and discuss their roles in promoting their tracks and series, as well as motor racing in southern Ontario. Expected participants include: Gord Bennett (Full Throttle Motor Speedway), Gary Colling (Flamboro Speedway), Dave Gainforth (OSCAAR), Clinton Geoffrey (Ohsweken Speedway), Brittney Gresel (Sauble Speedway), J.P. Josiasse (Peterborough Speedway), Alex Nagy (Jukasa Motor Speedway), Mark Rinaldi (Brighton Speedway) and Brian Todish (Sunset Speedway). 11:00 to 12:00 a.m. – MOTORAMA’S 2019 CELEBRITY GUESTS: This year’s celebrity guests at Motorama include: Tom Smith (Misfit Garage / Fired up Garage), Lou Santiago (co-host of Discovery Velocity’s The Car Fix, presented by Lincoln Electric), Bogi Lateiner (co-host of All Girls Garage on Discovery Velocity, presented by BASF Canada), Canada’s Grant Schwartz, from Seasons 2 & 3 of Vegas Rat Rods and Schwartz Welding and TJ Zizzo (NHRA Top Fuel racer, presented by Rust-Oleum). See and hear them on-stage as they participate in a Q&A with the fans. 12:30 p.m. to 1:25 p.m. – DRAG RACING DISCUSSION PANEL: This year’s Motorama show boasts several honoured guests from the drag racing world. Hosted by Bill Richards and Larry Satchell, expected participants in this panel include: Andrew Stirk (DSE Spt. Promotions), Neale Armstrong (Toronto Motorsports Park and driver of the Northern Warrior Jet Dragster), Martin D’Anjou of Quebec’s FestiDrag racing series, Ian Hill of the Ontario Grudge Wars racing series, Rick Kopp (driver of the Bone Shaker Jet Dragster Truck), Lisa Groves (owner of the Bonfield Event Park drag racing facility), TJ Zizzo (NHRA Top Fuel drag racer) and Ontario drag racer Nick Agostino. 1:45 p.m. to 2:40 p.m. – SEMA & STAR BUILDERS: Show announcer Rick Seeley hosts this on-stage session that features several builders who caught our attention at SEMA and have brought their vehicles to Motorama, as well as some other amazing builders. They include Eddie Pettus from Iowa’s Eddie’s Rod and Custom (Cedar Rapids, IO), Danny D’Erasmo of Six Twelve Auto Worx (Nanuet, NY), Karl Schulman of Garret’s Rod Shop (Columbus, OH), Murray Pfaff of Pfaff Design (Royal Oak, MI), JF Launier of JF Kustoms (Osoyoos, BC) and others. Be sure to check out their feature vehicles in Hall 2. 3:00 to 4:00 p.m. – SHOW CAR CLASS AWARDS: Hosted by Rick Seeley, Gary Challice and two celebrity guests, with more than 200 vehicles in competition, there are dozens of different classes and categories to be judged. The class awards will be announced and presented on The Rust-Oleum Stage during this session. 4:15 to 5:30 p.m. – DRAG RACING NIGHT OF CHAMPIONS PRESENTED BY STONERIDGE SPECIALTY INSURANCE: Bill Richards and Larry Satchell return – with a special appearance by NHRA Top Fuel racer TJ Zizzo – to host this awards presentation which honours Canadian drag racers who won track or series championships during the 2018 season. More than 40 champs have registered for this special awards presentation. 6:00 to 7:45 p.m. – SHORT TRACK NIGHT OF CHAMPIONS PRESENTED BY STONERIDGE SPECIALTY INSURANCE: Hosts Greg Calnan and Gary Colling will be joined by celebrity guests to honour dirt and asphalt oval track racers who won year-end track or series championships in 2018. Each champion will receive a plaque and will be interviewed about their title-winning campaigns. Special thanks to Image Factor Media, Inside Track Motorsport News, MAVTV Canada, Quaker State and Rust-Oleum for their support of this ceremony which will honour almost 90 short track champs. 10:30 a.m. to 11:25 a.m. – CAR SHOW PROMOTERS PANEL: Several of North America’s top car show promoters will talk about what’s new for 2018 for their respective shows, leading into a Q&A discussion about the hobby. Expected participants include: Jim Pearsall (Syracuse Nationals), Bill Doherty (Atlantic Nationals), Bob Larivee (founder of Detroit Autorama), Kristine Hill (Summer Showdown), Brandon Roberts (Jalopy Jam Up), Martin D’Anjou (International Lévis Auto Show) and a representative of Oshawa Autofest. 11:30 a.m. to 1:15 p.m. – MEET THE MEDIA: One of the show’s longest-running and most popular on-stage features. Several members of the Canadian motorsports and automotive media discuss issues related to Canadian and International racing. Expected participants include: Erik Tomas (Raceline Radio Network), Norris McDonald (Toronto Star), James Neilson and Wally Nesbitt (Inside Track Motorsport News), Todd Lewis (NASCAR Pinty’s Series and Porsche GT3 race broadcasts), Mike Garrow (MAVTV Canada) and Tim Miller (Hamilton Spectator / Inside Track Motorsport News). 1:45 to 2:40 p.m. – HOT ROD PANEL: Legendary hot rod personality and Motorama Show Car organizer Gary Challice will be joined by Show Announcer Rick Seeley to host this discussion featuring several prominent members of the hot rod, custom car and classic car communities. Expected to participate on the panel are several local prominent builders with vehicles at Motorama, including Keith MacIntyre (Binbrook Speed & Custom), Scott Forbes (Hitman Hot Rods) and others, as well as several celebrity guests. 3:00 p.m. to 5:00 p.m. – SHOW CAR SPECIAL AWARDS: Hosted by Rick Seeley and Gary Challice, and some of our celebrity guest presenters, dozens of awards will be handed out at the show, including the Motorama Grand Champion who will be presented with a $5,000.00 cheque! DJ Swankenstein will be playing music all weekend long (all three days!) on the Zehr Insurance Mayhem Stage. On Saturday at 1:30 p.m., the inaugural Miss Motorama Pinup Pageant takes to the stage, and will be followed by three incredible Rockabilly bands. The Royal Crowns go on at 4:15. The Greasemarks play their farewell (for now) gig at 5:45, and the Rhythm Shakers – all the way from Los Angeles – are the headline act, staring at 7:00 and going until close. On Sunday, Cherry Dollface hosts a “Hair & Makeup Demo” at 11:30 a.m., which is followed by a live auction (at 1:30 p.m.) to benefit the Stopgap Foundation (www.stopgap.ca), a group that works to promote awareness about accessibility issues and provides ramps to overcome barriers. The Mayhem car awards presentation starts at 3:00 p.m. The Spring Fever Stage will be busy throughout the weekend as DJ MSequence plays music all three days of the show. On Sunday at noon, the Spring Fever Awards presentations will take to the stage.